Mamonde has finally announced its holiday themed collection, and its focal point as you might have guessed, is all about flowers! 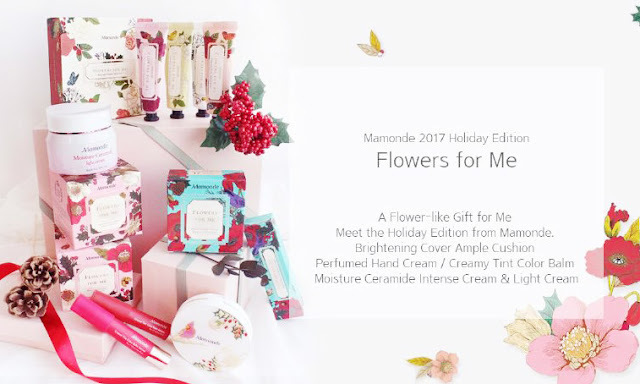 With Christmas just about to come at hand in December, Mamonde has curated beautiful holiday sets, one that has been packaged in beautifully designed boxes, and are printed with vibrant graphics of the Mamonde Garden in harmony with butterflies and birds. Now the holiday collection consists of 4 flower-amazing sets for you to pamper yourself and your loved ones with, and within it also includes a limited Edition Creamy Tint Color Balm Intense and a Holiday Limited Edition Brightening Cover Powder Cushion as well. 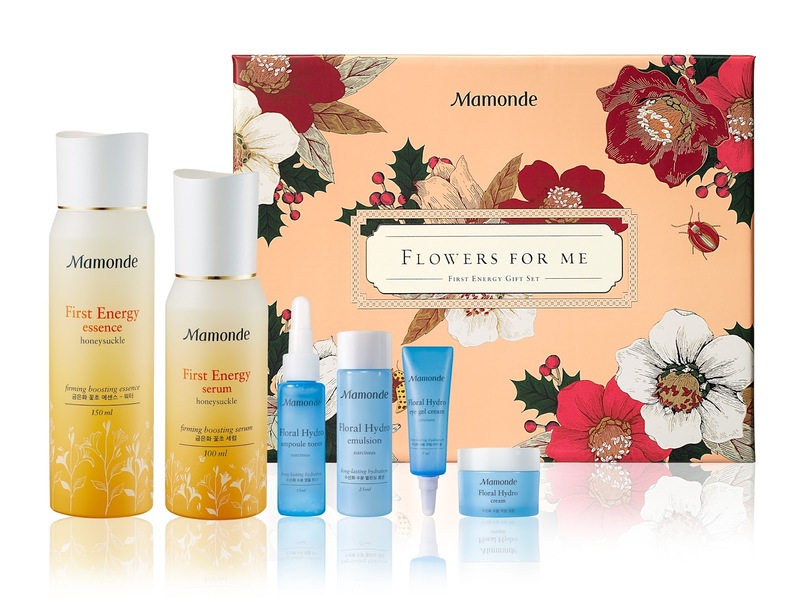 This first set features Mamonde's best sellers such as the wondrous First Energy Serum and First Energy essence and the hydrating Floral Hydro Line. The set includes the First Energy Serum (Full Size), First Energy Essence (Full Size), the Floral Hydro Ampoule Toner (15ml), the Floral Hydro Emulsion (25ml), the Floral Hydro Eye Gel Cream (5ml) and the the Floral Hydro Cream (15ml). Next up, we have the Holiday Makeup Set (21) & (23), featuring the Creamy Tint Color Balm Intense and Brightening Cover Powder Cushion. The set includes a Brightening Cover Powder Cushion in Medium Beige (21N) or Natural Beige (23N) 15g, and a Creamy Tint Color Balm Intense No.05 in Blooming Rose, 2.5g, and another Creamy Tint Color Balm Intense in No.11 in Velvet Red, 2.5g. It is also good to note that if you are only planning on getting the lip shades, you can always opt for the Holiday Limited edition Creamy Tint Color Balm set at RM50 (worth RM55), which hold the two same shades as well. As for the last set in the collective, here we have the Hand Cream Set that is ideal for those who are in need of moisture care. The range features a variety of flowers, each with unique properties and functionalities for the skin. The set includes the fragrance of Rose Bouquet, Gardenia Dream, Camellia Petal and Jasmine Cashmere; all at 30ml. 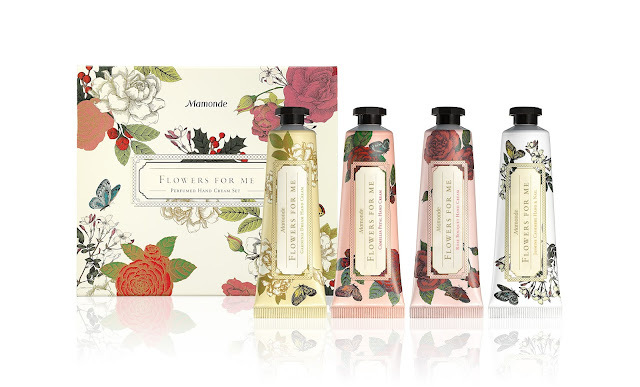 In the meantime, all Mamonde 'Flowers for Me' sets can be located at Aeon 1 Utama, Aeon Mid valley and Parkson at Suria KLCC. They will also be available on 11street and Lazada.com as well.